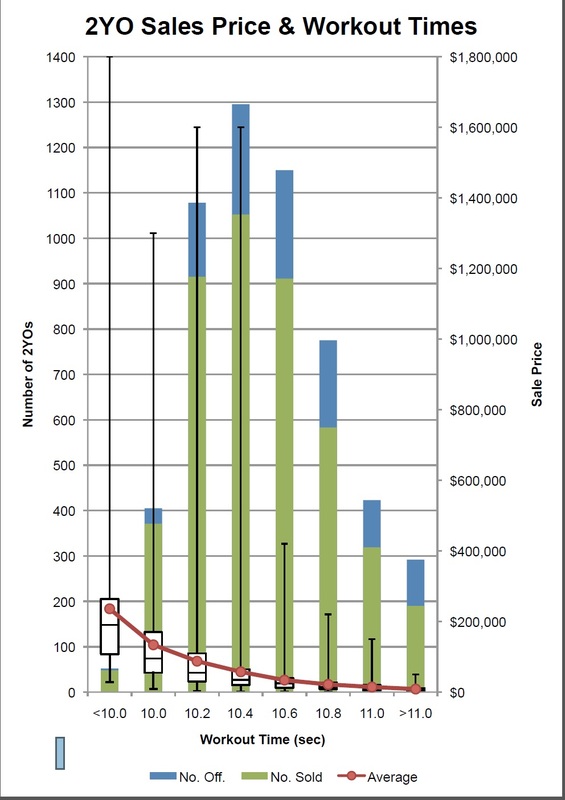 As mentioned in an earlier post on 2-year-old ROR, sales 2-year-olds as a whole achieve a higher rate of return in racetrack earnings than sales yearlings largely because buyers are able to see at least one workout before purchasing. 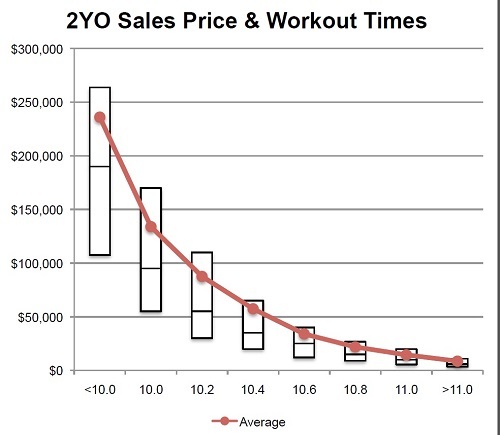 Since workouts have a significant effect on buyers' decisions, MarketWatch used the breeze times and sales prices of 2-year-olds in training offered at the Ocala Breeders' Sales Co.'s March sale, OBS April, and OBS June from 2011-14 to illustrate the relationship between breeze time and sales price. The charts below include all 2-year-olds that breezed an eighth of a mile and were offered at the sales listed above. 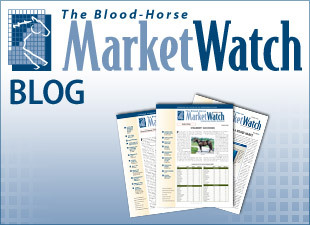 While only a small number of horses breezed a furlong faster than 10 seconds (1.1% of all sold), this group realized the highest average and included the highest-priced 2-year-old of these sales, a $1.8 million colt that breezed an eighth in 9.8 seconds. The average sales price for a juvenile with a breeze time under 10 seconds is $236,042, 76% higher than horses breezing in exactly 10 seconds. The graphs show that average price steadily declines as breeze times get slower. 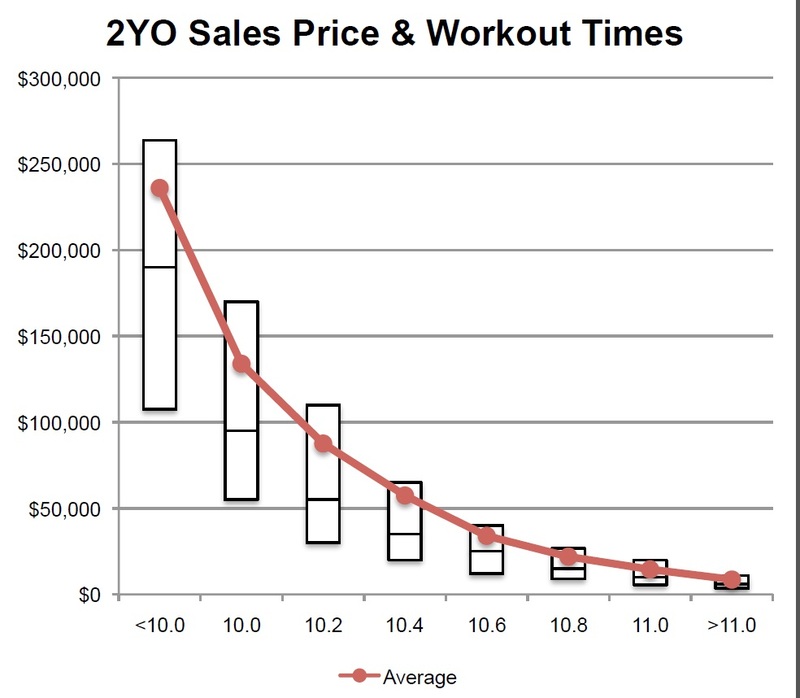 A time of 10.4 seconds appears to be the threshold beyond which buyers are reluctant to pay top dollar. No horse that breezed slower than 10.4 seconds realized a price greater than $420,000, while each of the faster time categories had at least one million-dollar hip. Average sales price decreased dramatically (-69%) between horses that breezed an eighth in 10.4 seconds and those that breezed in 10.6 seconds.